The DJI Osmo Handheld 4K Camera and 3 Axis Gimbal is definitely one of the most innovative photography devices today that delivers the advantage of stabilized 4K shooting to handheld devices. Firstly, the Osmo is packed with some excellent specs like the 1/2.3inch CMOS sensor, which comprises of the ability to shoot Full 4K videos (4096 x 2160 pixels) at 24 or 25p, as well as 12MP still photos. A 3 axis stabilization system that is integrated within the camera cancels out movements in three directions, so your photographs stay still even if your move or shake. In addition, basic controls for the camera and gimbal are situated on the handle itself. For monitoring and more advanced operation, the Osmo to be tethered to a mobile device running the DJI GO app. An included phone holder efficiently transforms your smartphone into an onboard monitor and allows you to see what your camera sees. The grip on the Osmo is designed with materials selected for utmost comfort and durability. The DJI Osmo helps capture time more easily than ever, with its Time Lapse feature. The Osmo lets you shoot smooth videos while standing still or moving through your world, all without a tripod. The DJI Osmo allows you to snap great long exposure shots, which are crisp and sharp, all without a tripod. The integrated stabilization system keeps the camera still, so that you can capture stills of up to 2 seconds. The DJI Osmo offers sharp and blur free images, with the assistance of its 3 axis stabilization system. It cancels movement in three directions, enabling your image to remain still even if your shake or move. The DJI Osmo is crafted with high quality materials that offer comfort and durability. It has controls and buttons placed within easy reach of your thumb for instant access. Moreover, you can even place your smartphone in the phone holder to see what your mobile sees and even control settings with a tap. Your phone is also the place of all the Osmo’s powerful, creative shooting modes. 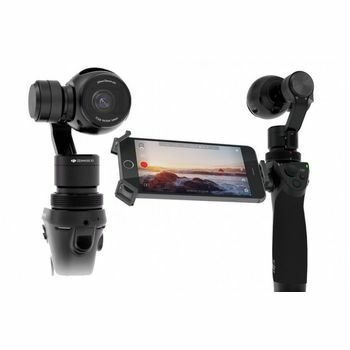 The DJI Osmo Handheld 4K Camera and 3 Axis Gimbal is definitely one of the most innovative photography devices today that delivers the advantage of stabilized 4K shooting to handheld devices. Firstly, the Osmo is packed with some excellent specs like the 1/2.3inch CMOS sensor, which comprises of the ability to shoot Full 4K videos (4096 x 2160 pixels) at 24 or 25p, as well as 12MP still photos. A 3 axis stabilization system that is integrated within the camera cancels out movements in three directions, so your photographs stay still even if your move or shake. In addition, basic controls for the camera and gimbal are situated on the handle itself. For monitoring and more advanced operation, the Osmo to be tethered to a mobile device running the DJI GO app. An included phone holder efficiently transforms your smartphone into an onboard monitor and allows you to see what your camera sees. The grip on the Osmo is designed with materials selected for utmost comfort and durability. REIMAGINE MOVEMENT Motion without blur. Action shots without shake. Perfect video even when you move. Thanks to advanced technologies specifically designed to keep the camera flat no matter how you move it, the DJI Osmo helps you record videos and take photos like never before. It is much more than just a camera. It helps you create with more freedom than ever. THE WORLD IN 360° The Automatic Panorama mode makes shooting 360° panoramas easier than ever. Just hold the Osmo up above your head and tap the shutter button. The camera will rotate, capturing images as it goes while staying completely level. Don’t just get a snapshot of a piece of your travels. Make a memory of the whole scene. CAPTURE TIME Osmo helps you record the passage of time more easily than ever. Whether standing still for a stationary timelapse, or moving through your world for a hyperlapse, you can create smooth videos automatically and easily without a tripod. TIME LAPSE The DJI Osmo helps capture time more easily than ever, with its Time Lapse feature. The Osmo lets you shoot smooth videos while standing still or moving through your world, all without a tripod. LONG EXPOSURE SHOTS The DJI Osmo allows you to snap great long exposure shots, which are crisp and sharp, all without a tripod. The integrated stabilization system keeps the camera still, so that you can capture stills of up to 2 seconds. 3 AXIS STABILIZATION The DJI Osmo offers sharp and blur free images, with the assistance of its 3 axis stabilization system. It cancels movement in three directions, enabling your image to remain still even if your shake or move. HANDHELD POWER The DJI Osmo is crafted with high quality materials that offer comfort and durability. It has controls and buttons placed within easy reach of your thumb for instant access. Moreover, you can even place your smartphone in the phone holder to see what your mobile sees and even control settings with a tap. Your phone is also the place of all the Osmo’s powerful, creative shooting modes. REMOTE CONTROL All of DJI's Smart Shooting modes can be controlled and triggered by remote control from within the DJI GO app on your smartphone. Mount the Osmo on a tripod, or any of the other available mounts, and take a few steps back to a position from where you can easily overlook the scene and control the camera.